Anticipating the death of President Barack Obama's health care overhaul, Mitt Romney outlined his plans Tuesday to expand coverage to the nation's uninsured, while protecting at least one popular safeguard that would be eliminated should the Supreme Court strike down the law. ORLANDO, Fla. (AP) — Anticipating the death of President Barack Obama’s health care overhaul, Mitt Romney outlined his plans Tuesday to expand coverage to the nation’s uninsured, while protecting at least one popular safeguard that would be eliminated should the Supreme Court strike down the law. The presumptive Republican presidential nominee promised to help maintain coverage for those with pre-existing health conditions and expand tax breaks to individuals wishing to purchase health insurance directly, instead of through their employer. In some cases, his health care proposal entails turning over the problem to individual states. “It’s important for us to make sure that every American has access to good health care,” Romney declared at a campaign stop in Orlando. With the Supreme Court ruling expected this month, the Republican presidential contender is eager to look forward and offer his own prescriptions for the health care system that voters consistently rank among their priorities. Romney’s plans, however, were short on detail and raised questions about how the nation’s 50 million uninsured might fare under his leadership. Romney ignored the primary strategies he pursued as governor of Massachusetts. There, he signed into law a measure that insures virtually all of its citizens by requiring insurance policies and offering subsidies to those who can’t afford it. The so-called “individual mandate” is at the heart of the case before the Supreme Court on the law’s constitutionality. As president, Romney’s plan to cover the nation’s uninsured involves sending federal Medicaid dollars directly to states, allowing each state government to address the situation in its own way. “Let states care for their own people in the way they think best. 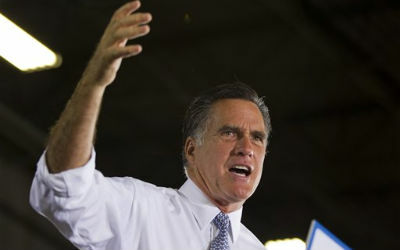 That in my view is the best way to care for the uninsured,” Romney said. The Romney campaign said states would receive Medicaid funding increases “every single year,” but would not detail the extent of the increases, which are unlikely to cover the additional cost of providing insurance subsidies to millions of Americans as Obama’s plan would. Cash-strapped states often look to cut health care programs for the poor or low-income to help balance their budgets. The Romney campaign said states would benefit from billions of dollars saved by streamlining the Medicaid process and eliminating fraud. Obama’s re-election campaign has been aggressively touting the benefits of the health care law, but says it expects the Supreme Court to uphold the overhaul. Obama addressed the issue Monday in an interview with a Colorado television station. The campaign on Tuesday attacked the president’s Republican rival, suggesting he wants to take the country backward. “This morning, Mitt Romney promised that if he’s elected, insurance companies will be able to discriminate against Americans with pre-existing conditions, charge women higher premiums than they charge men for the same coverage, and kick young adults off their parents’ plans when they graduate high school or college,” said Obama spokeswoman Lis Smith. Romney said any law that replaced Obama’s should prevent insurance companies from dropping people with pre-existing conditions. He did not address the provision that allows people to stay on their parents’ health insurance until they turn 25. Some insurance companies recently indicated a willingness to maintain that provision, even if the law is repealed. Those who take advantage, however, may have to pay more if the law is struck down because they wouldn’t be allowed to use pre-tax dollars to fund the child’s premiums. Romney also said he would “level the playing field” and give individuals tax breaks currently offered to employers to buy health insurance directly. It’s unclear how much that might cost the federal government or how the measure fits with Romney’s larger plan to reform the tax code. But he made clear that his first priority would be to do away with the health care law. “If I’m the president at a time that the Supreme Court has left ObamaCare in place, I will repeal it on Day 1 by sending out a waiver to all 50 states,” Romney said.